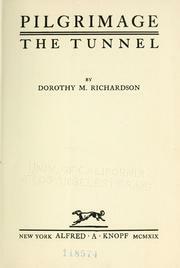 Today begins a total splurge of reviews of the remaining novels in Dorothy Richardson’s Pilgrimage. I’ve already written about the first volume, Pointed Roofs, and Backwater and Honeycomb. Today I’m tackling The Tunnel and Interim, and next week’s posts begin with a long conversation with Brad Bigelow of The Neglected Books Page about how we both read Pilgrimage (more or less simultaneously over the past few months), and what we thought about it as a reading experience. After that you’ll get a new post every day, on Deadlock and Revolving Lights, The Trap and Oberland, Dawn’s Left Hand and Clear Horizon, and finally Dimple Hill and March Moonlight (Brad lent me his copy, and the cover is a doozy). Writing about Pilgrimage has begun to arrange itself naturally into two-volume chunks. Pointed Roofs needed a post to itself, since it is the opening volume and the beginning of the project. Backwater and Honeycomb contrast remarkably well in various ways. The Tunnel and Interim are the beginning of Miriam Henderson’s London life. They’re very long, and display modernist and innovative writing techniques in the most staccato prose so far. 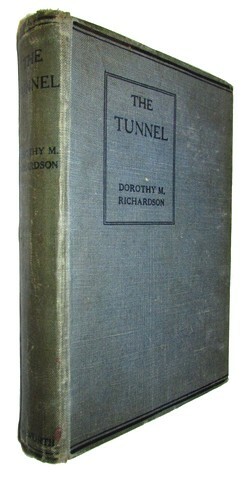 The Tunnel describes a string of incidents from Miriam’s new life living in an attic room in a boarding house in Tansley Street, running perpendicular to the south side of the Euston Road, now assumed to be Endsleigh Street, where Richardson lived herself. The houses there are a smart and uniform flat-fronted Georgian terrace, now extremely desirable residences and probably all owned by University College London or other bits of the University of London. 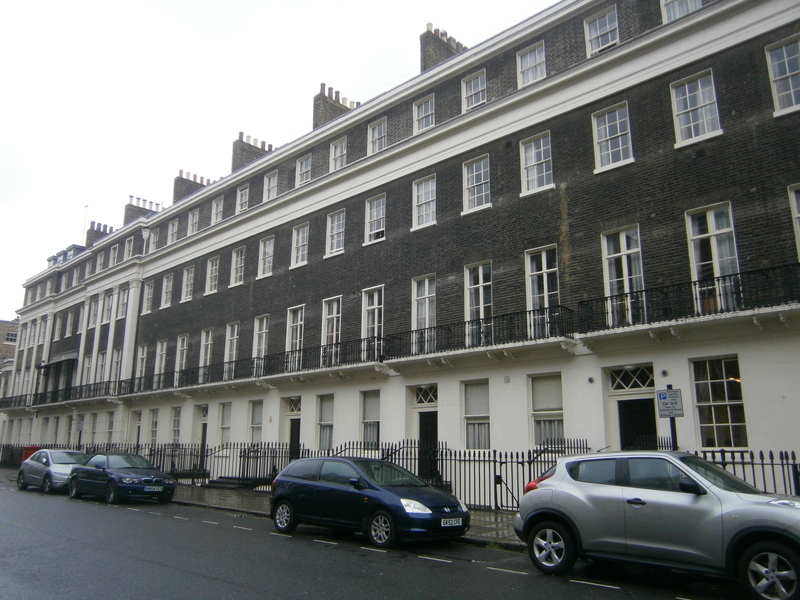 In Richardson’s day these were artisanal dwellings and rented rooms for the clerkly and secretarial classes. Running parallel to the torrent of information in the novel about living in London in the 1890s as a young and single woman, we read about the crucial element that makes this possible: Miriam is earning her living as a dentist’s secretary and assistant. She loves her job. 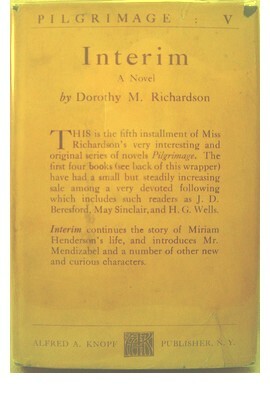 Richardson writes Miriam as if she herself doesn’t think she’s very good at it, but there is no mistaking the joy in having her own room in the Wimpole Street dental practice, running up and down the stairs preparing the surgery for the next patient, dealing with the bills and paperwork, ordering supplies, negotiating with the boys and men in the basement about the make-up of false teeth and other deliveries. Miriam takes her meals with the dentists Mr Hancock, Mr Orly and young Mr Leighton Orly, and Mrs Orly: she is part of the family. Back in Tansley Street she is part of an ever-shifting family of lodgers, living in an unheated attic which is hers and hers alone. No more schoolgirls sharing her space, no more chalk, no more lessons, no more awkward employers who launch emotional terrorism on the girls under Miriam’s care. She is still employed – a subject that will exercise her more in years and books to come – but she is one step further removed from being the live-in servant that she was as a teacher. She is independent, answering to no-one, except Mr Hancock when she comes back to London a little late on a Monday morning after a weekend with her sisters. Since the novel is so focused on Miriam we have to glean what we can about the conventional components in a story whose events follow those in earlier instalments: what happened to Mrs Henderson? Where is the disgraced father? In what order of age are Sarah, Harriett, Eve, and Miriam? Is all well with the brothers-in-law Bennett and Gerald? What happened to the young and not-so-young men that Miriam was seeing in Honeycomb? None of this this mentioned in The Tunnel, or later novels, except by dropped remarks here and there, which shows so effectively how interiority works in a modernist novel: it’s all about the central character’s experiences, and nothing else matters. We have to relearn how to read a story. The sheer modernity of the experiences Miriam is having are stunning. The Tunnel was published almost a hundred years ago, in 1919, about a woman in 1896,* and her daily routine is no different from any secretary or assistant working in London today, barring the technology and public transport revolutions. Miriam is far closer to our lives than any of the female characters in Arnold Bennett, George Gissing or H G Wells’ novels (all were contemporaries of Richardson and Miriam): is this because Miriam is written by a woman? Or because her experiences are so interiorised, essentially of the mind, and experiences of living in the modern age? I’d plump for the latter. Gissing’s The Odd Women (1893) contains many characters like Miriam, but the milieu they live in is rigidly Victorian. Miriam is an exultant New Woman, living a parallel life in the 1890s that is all about moving forward, not struggling with the past. 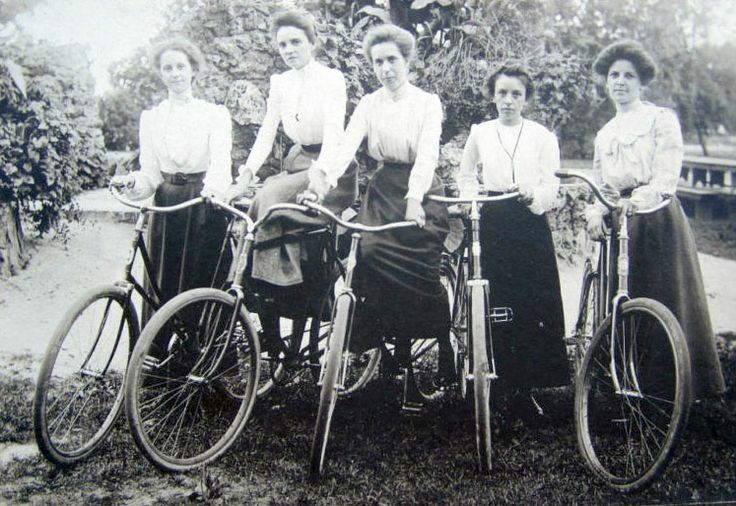 Miriam’s friends Mag and Jan take turns to ride their bicycle at midnight around Russell Square in their knickers: how modern is that? One episode typical of the period in The Tunnel is Miriam’s embrace of the bicycle. She learns to ride a bike with the help of Mr Leighton in Regent’s Park. She rents a bike, and she goes for an epic two-day solo cycling jaunt through Wiltshire and Savernake Forest, exulting at her speed and becoming increasingly alarmed at the technical knowledge she needs to learn to understand what happens when the bike breaks, and how to get it fixed. This is the classic New Woman trope: independence of movement, freedom to travel, and the speed to get away from threats. The Tunnel is packed with women’s lives. I doubt that any author before Richardson had written so densely about women and their daily lives and thoughts. Apart from the usual taboos about bodily functions, everything in a woman’s life is considered and discussed here, from Harriett’s pregnancy discomfort, to how to eat unconcernedly in public among strangers, to managing one’s laundry and personal freshness in broiling summer heat. The extraordinary Miss Eleanor Dear appears first in this novel: a woman slipping into poverty and degradation while struggling with tuberculosis and clutching at a semblance of genteel respectability: asking strangers for money, lying about jobs she’s going to and the money owed her when she owes money to everyone she’s ever met; forcing Miriam to run her errands and calling a doctor at midnight knowing full well there is nothing to pay him with; and trapping a clergyman into marriage. Miss Dear is a monster, but she is also a might-have-been for Miriam: no friends left, no chance of surviving her disease, no future of any kind, but she keeps on doggedly demanding, turning up in Miriam’s life because if she didn’t, she would starve and die in a week. Miriam is not so duplicitous, but with a job that pays her rent, and an increasing network of friends to supplement her dwindling contacts with her family, she doesn’t have to be, yet. Interim continues Miriam’s life, and the reader now urgently needs a contents list. Interim is ‘The One in which Miriam spends Christmas with the Philps girls and their Aunt’ (met in Backwater), and ‘The One in which Mrs Bailey turns the Tansley Street house into a Boarding House’, one crucial social step up from a lodging house, by offering meals and homelike musical evenings of conversation in the drawing-room. This unnerves Miriam severely: is she ready to socialise, and be part of a family again? How badly can she behave, and how antisocial can she be, when she longs to play the piano in the drawing-room? Interim is the ‘The One in which Miriam buys Lady Slater’s Second-Hand Bicycle’, and ‘The One in which Miriam is Courted Discreetly by a Respectable Canadian Doctor’, but she inadvertently blows that possibility by going out on the town with Mr Mendizabal, the Spanish Jewish waiter, to seedy nightclubs. She increases her intellectual and musical range by going to private concerns in basements and to public lectures. She is horrified and delighted when her sister Eve gives up her job as a paid companion to train as a London florist. This doesn’t last long: Eve is rather a lost cause for Miriam, much as she loves her. Interim contains marvellous lyrical passages of love for London streets, the colours of light and on music. Miriam responds needily to these moments, because she’s opening her eyes a little more judiciously to the grubbiness of London streets and the awkward and shameful aspects of struggling to eat and dress herself. She had a five-shilling raise in The Tunnel, but she still needs more income in Interim. She’s learning about the safe sides of the streets to walk along, and is beginning to feel a creeping fury at the double standards that men will apply to her. They might go to bars and nightclubs, but she may not. The young doctors treat her like a sister in the boarding house, since they are of the same class, the same background, with the conventional, social same expectations, or so they think. Miriam’s relentless search for the experiences she wants will change Dr Von Huber’s mind, as do Mr Mendizabel’s lies about her. The melodramatic possibilities in the events of Interim depend upon on the social rules that Miriam is breaking, possibly without realising it, but definitely without caring. * I’m using George H Thomson’s A Reader’s Guide to Dorothy Richardson’s Pilgrimage (1996) for the dates of the settings. For the other reviews of the volumes in Pilgrimage, see Pointed Roofs, Backwater and Honeycomb, Deadlock and Revolving Lights, The Trap and Oberland, Dawn’s Left Hand and Clear Horizon, and Dimple Hill and March Moonlight, and see also my conversation with Brad Bigelow of The Neglected Books page.